That’s sage advice from Ruth T. Jones, who never dreamed how pivotal staying in a YWCA emergency shelter at age 12 would be to her future. Today Jones is executive director of that very organization. The Virginia Beach native spoke to students at Tidewater Community College’s Portsmouth Campus as part of the Women’s Leadership Speaker Series, sponsored by the Women’s Center. “I never imagined I’d come back home to South Hampton Roads when I left here a little more than 20 years ago,” Jones said. 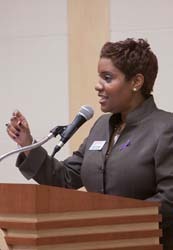 A graduate of Bayside High School, Jones earned her bachelor’s in sociology at the College of William & Mary followed by a master’s of social work from the University of Pennsylvania and a doctorate in social work from Catholic University. She was the first in her family to attend college and graduate. Discovering her calling didn’t come naturally. Jones stewed over the decision, considering careers as a doctor, teacher, lawyer and judge. A conversation with a social worker helped her find her purpose. • Have a vision for your life, and write that vision down. • Examine what you are most passionate about in life and use that in deciding a career path. • Don’t take your personal experiences for granted. “Everything happens for a reason,” she noted. • Invest in yourself, and make yourself indispensable. Students listening to Jones’ story shared with her how impressed they were with her perseverance.